Having smooth and fair skin is the dream of every girl. With the Malaysia's humid weather, putting on heavy cream-based skin care products is a definitely a taboo as it may cause breakouts. 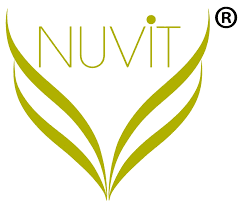 NUViT, an integration of ‘NEW’ and ‘VITALITY’, accentuates the importance of the needs and necessities of bare skin, refining the core of beauty, enhancing the most genuine and natural appeal from beneath. 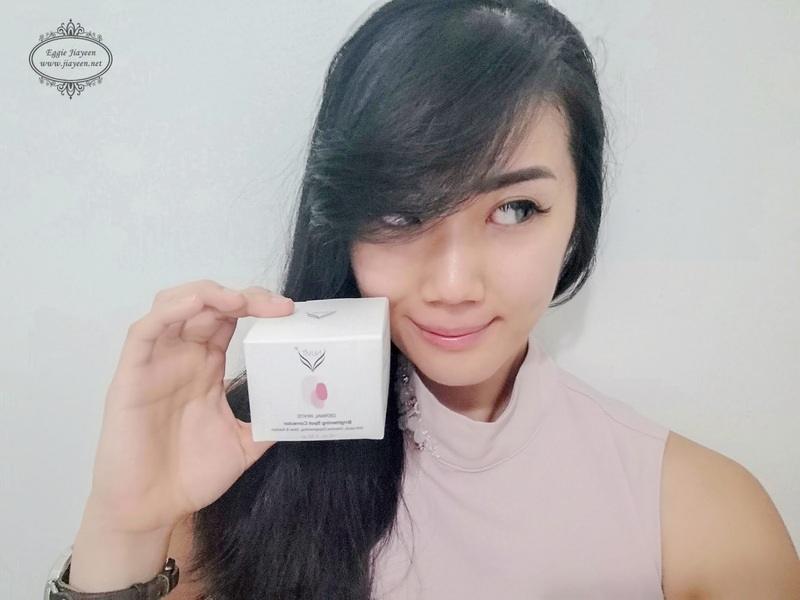 NUViT utilizes the most credible technology and studies to bring you highly effective formulations combined with organic or plant based extracts and high bioavailability nutrients to propel cosmeceutical care towards a new era. 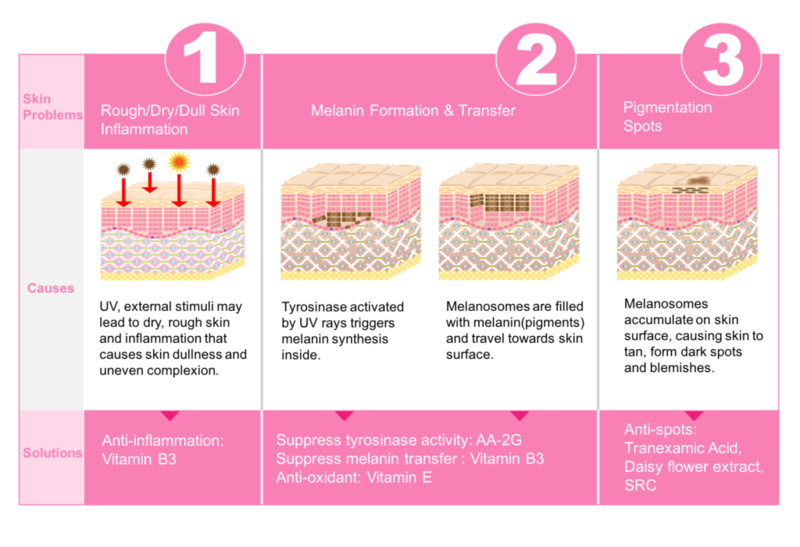 The diagram above illustrates how the external and internal factors harm our skin that leads to dull skin and uneven complexion. 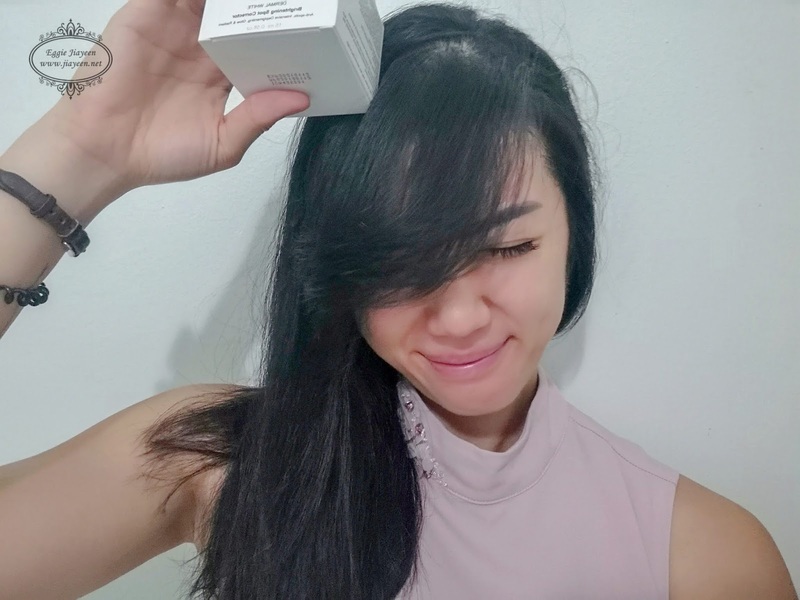 The unique whitening ingredient - B-trans5 (comprises mainly Tranexamic Acid, Daisy Flower Extract, Vitamin E, Vitamin B and Vitamin C). The three (3) concepts related to this series - SPOT, ENTIRE and ENHANCE which are also related to the products within this series (as below). Targets spots or specific area on face, to be used daily both day and night. 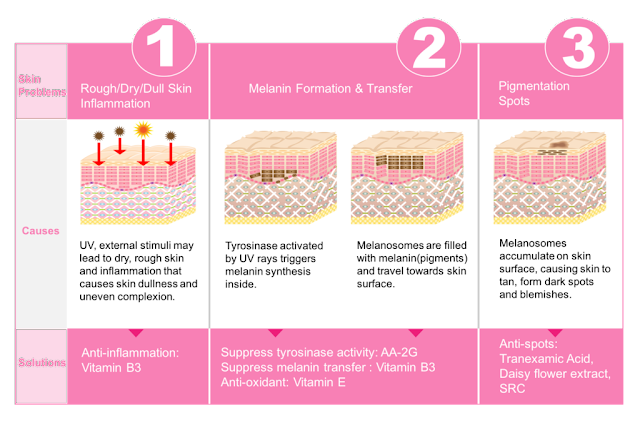 Desalinates Spots, Inhibits Melanin Production and Metabolizes Melanin. To be used daily on entire face both day and night. 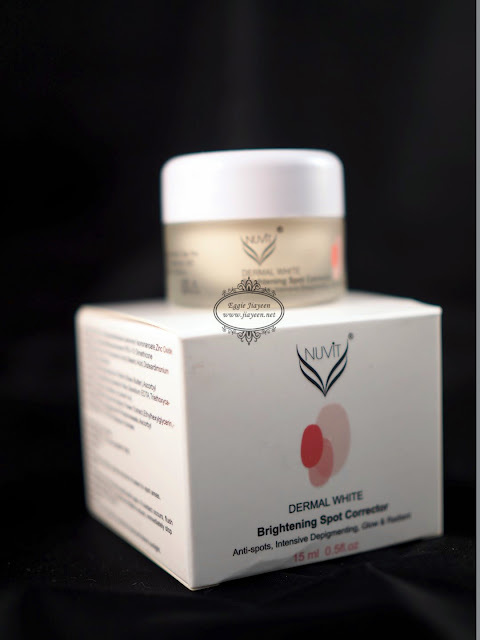 Improves Dullness, Boosts Radiance, Balance Skin Tone and Revitalizes Skin. 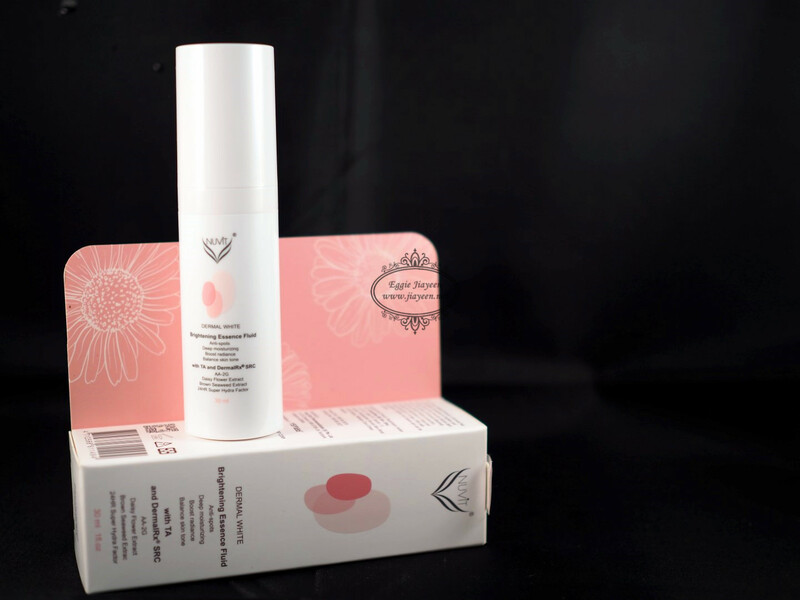 Anti-Spots, Intensive Depigmenting, Glows and Radiates, Anti-Pollutant and Reduces UV Ray Damages. The texture is simply light. At first I thought it would feel heavy and sticky on my skin but hey! I was surprised with the gel-like texture! The absorption was great too! 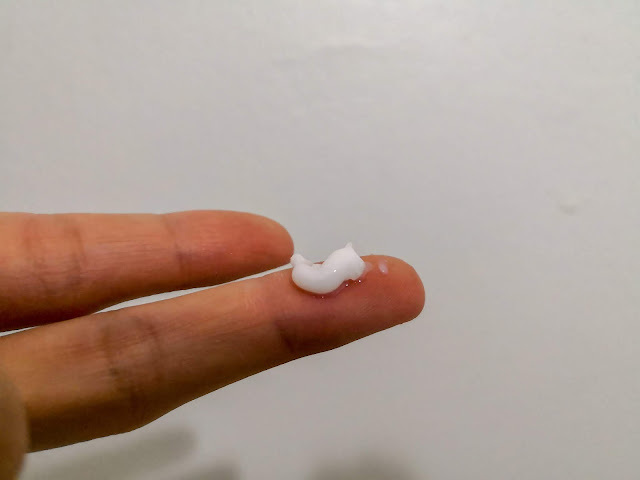 It leaves no stickiness on my skin! It is recommended to follow the sequence of usage: Brightening Spot Correcting Serum, Brightening Essence Fluid & Brightening Spot Corrector. However, different people have different problems. Hence, the sequence could tweak a little to suit personal needs. For more information or check our other series, do visit HERE.